By Ken Levine: What's better -- first or last? Casting calls are always stressful for actors – especially if they find they have to go either first or last. There are disadvantages to either but actors always wonder which is worse? I can tell you my impressions from sitting on the other side of the room as a producer. First off, if you don’t give a good audition it makes no difference where in the line up you are. You won’t get the job. So for now I’m assuming you are good, even good enough to land the part. And it goes without saying that if you absolutely hit it out of the park it makes no difference when you come in. Generally there are expectations that we are going to see good people. They’ve been hand-picked by the casting director so the quality should be somewhat high. But that means if you give a terrific audition we might think, “Promising. If that’s just the first person there will probably be others who are better.” So you’re somewhat penalized. But you’re now the yardstick. Can the subsequent actors beat you? It’s not an enviable position. The big problem here is if others have already impressed us our minds might be made up before you walk in the door. And then to win the part you have to blow us away. The other problem is that we’ve now heard the same scene numerous times and we’re tired of hearing it (especially since half the time we hear it performed poorly). The advantage of going last is that if we haven’t found someone by the time you enter we sooooooo want you to nail it. Even an okay audition gets elevated. SO WHICH WOULD I PREFER? I would think going first is preferable. At least we’re fresh and hopeful. And by going first you know you’ll really be considered. Like I said, if you go last often times the decision has already been made and now you and we are just going through the motions. You have to really pull a Hail Mary. By the way, sometimes an actor who knows he’s scheduled first will come in late so he has to go later. Don’t pull that. We know what you’re doing, and if nothing else your tardiness sends a message you're unreliable. Wherever your scheduled, just do the best job you can. Remember, a truly great audition will get you the job whether you’re first, third, eighth, or last. My heart goes out to all you actors. Auditions are brutal. It’s not enough how good you are but where you are in the day’s call sheet. But remember one thing, ultimately we want you to do well. We want you to crush it. And we’re thrilled when you do. As always, the very best of luck. I remember a scene from Pamela Adlon's BETTER THINGS series where she was auditioning for a part; when Julie Bowen waltzed in and exchanged friendly greetings with the casters, Adlon threw up her hands and walked out. Based on personal experience? There is a story that Don Adams started using Adams, his wife's last name, instead of his real last name of Yarmy when he saw long line to audition for Arthur Godfrey show (which he ended up winning) that was arranged alphabetical. Reminds me of a story I heard. One actor, when asked about audition order, said it's best to be either first or last. He noted that when people see a train, they remember the engine and the caboose, not the 30 or 40 cars in the middle. 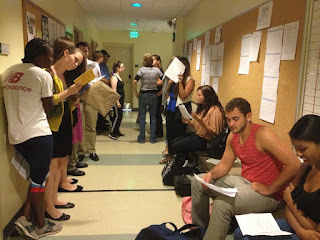 Auditions = interviews. In my non-acting career, it was always a process of winnowing. The first one is the best so far, and "has" the job. The second person has to be better than them to stay in the running. If the do, they're the "best" (and they "have" the job), then the others have to "beat" that person. The 3rd, 4th, 5th... 9th one has to "beat" the "best" so far, and the last one does, too. First or last never mattered in that process, though I will say we never had the problem of hearing the exact same thing over and over again. The only challenging parts were run-offs where you had a tie for 2/3 "best" candidates, equally as good but different for different reasons -- or the "best" one just isn't good enough. In the latter case, you're seriously hooped if the "best" isn't very good, but it's all you've got and all you're going to get. But the clear message is "Bring your A-Game" every time to every audition & interview. Then you can walk out with your head held high every time, and know that there was nothing more you could have done. Because, as everyone knows, there's ALWAYS someone out there better at you at pretty much everything (unless you play tennis and your name is Serena Williams). I'm going to ask a naive question, because I don't have direct experience with this--but wouldn't it make more sense, for everyone involved, just to only schedule casting auditions in smaller amounts? Say, use a lunch break to see maybe four auditions. That way, the actors don't have to wait around in a crowded hallway forever, getting steadily more nervous and/or tired, the casting crew doesn't have to get burned out hearing the same lines recited a million times...doesn't that just make sense? And yes, I know, time is money, blah blah. But if it makes the auditions worse, why do it? Put it another way: Why does the "cattle call" model continue to dominate? It just seems counterproductive for everyone. The big question is, are the criteria the same regardless of the medium? I would guess that it's more exhausting auditioning stage actors than for film or TV. I know in voice acting the producers/directors aren't always sure about what they want, only what they hate. And what about callbacks? Do things change if it's the second or third time you've seen someone? I wonder if Harvey Weinstein preferred... No, no. Forget I said that. How about when the actor comes in and decides to "make it his own?" Like, hey dude/dudette, just say the lines as written. There's a reason it's written that way. I would like to hear about your experience in casting calls. I know you have always been the caster. Your best, your worst, sleeper picks that worked. Have you considered giving the candidates a rating between one and five, and then going on from there? Having gotten over the ordinals, you can check signals for, oh, I dunno, blonde hair and blue eyes, a timbre appropriate to the part, the ability to improvise, being a clothes horse, ou know? that nose is pretty cute!, whatever it takes. Apparently Hollywood is an Industry. Who'd a thunk? Do people seriously go to readings dressed like bums? You'd think they'd want to make a good impression.